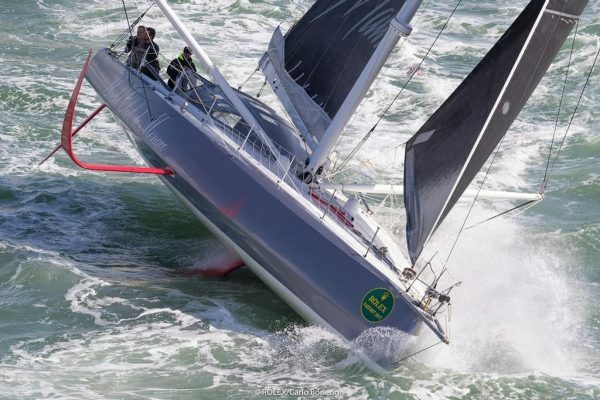 After months of speculation – Yachting World broke the story than the IMOCA 60 class were in the final stages of negotiation with the Volvo Ocean Race back in April – organisers have confirmed that the next edition of the crewed multi-stage round the world race will take place in IMOCA 60 class yachts. In the very final days of the race, a confidential Educational Session for interested parties was held around the IMOCA Class Rules in The Hague last week. The announcement was only publically confirmed yesterday, after the prizegivings for the 2017-18 event had been held and the Volvo Ocean Race teams and sponsors dispersed. 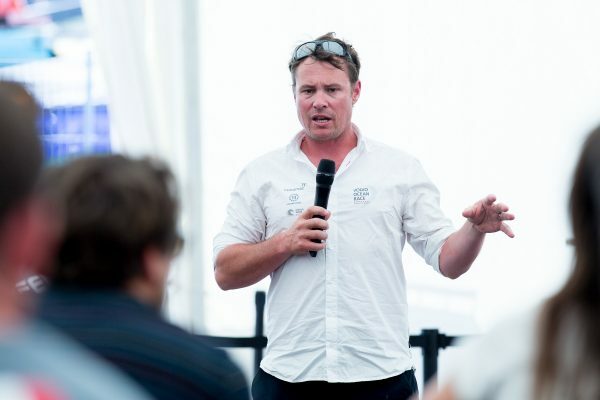 At the session, sailors and team managers from the most recent Volvo Ocean Race and IMOCA events, along with yacht designers currently involved in construction of new IMOCA Class boats such as Guillaume Verdier and Juan Kouyoumdjian, discussed the changes. 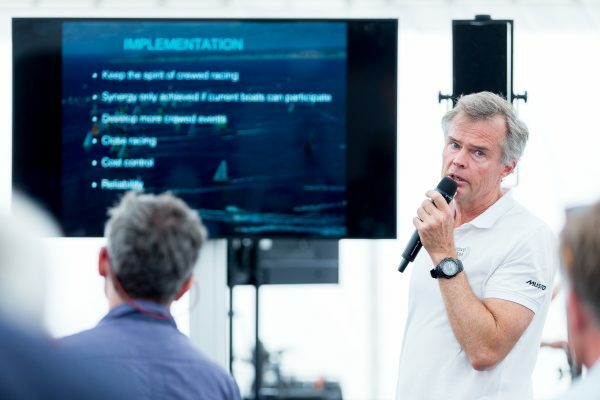 Co-President of the Volvo Ocean Race, Johan Salen, presenting at the IMOCA 60 partnership information session in The Hague, 28th June 2018. “This is a first step of many in preparing for the next edition of the race in 2021,” said Johan Salén , co-President of the race. “There is an ongoing co-operation process to put in place the elements we need to make the next race a success from a sporting and business point of view. Organisers are certainly likely to receive plenty of input – during my visit to the last stage of the Volvo Ocean Race, before the announcement was made, I spoke to numerous sailors about the possible choices of boat for future editions of the race and found almost no consensus. David Witt, skipper of Sun Hung Kai Scallywag, told me: “I think the IMOCA 60 would be a mistake. I have a feeling their [organisers’] motive is to try and get the Hugo Bosses and big corporates to come in from the Vendée Globe.” Witt was concerned the move might make the Volvo Ocean Race a second-tier event in the IMOCA calendar to the single-handed Vendée Globe. Chris Nicholson, watch captain on Team AkzoNobel and a veteran of six Whitbread/Volvo races, supported using the one-design 65s again. He was among those that raised concerns about the robustness of the existing IMOCA design. Bruno Dubois, team manager for winners Dongfeng Race Team, felt that the race needed to modernise: “I think if we go with a boat with no foils we are in the Stone Age,” he said. “We have to be at the forefront of what’s going on. I think IMOCA are strong boats, they would have to be modified to sail with crew, but it is a way to go to get development.” Dubois also suggested using the 65s as a ‘B’ fleet, restricted by a gender, age or nationality rule. The future of the Volvo 65s is yet to be announced. In yesterday’s press release, organisers say a joint committee is being formed to draft a specific section of the IMOCA class rules for a crewed IMOCA 60, “respecting the spirit and intent of the partnership, which includes cost control, security and sporting fairness”. The committee will have to consider factors such as whether any more components are made one-design to reduce costs, and any necessary structural modifications to ensure the boats’ reliability – many have speculated that the race could once again be dominated by rig failures, after just two rig breakages in 14 circumnavigations by the robustly over-built 65s across the last two editions of the race. Critically, the rule relating to crew numbers on board the IMOCA class is still to be determined and among the items under consideration. Organisers say they have “the goal of retaining an On Board Reporter role”. 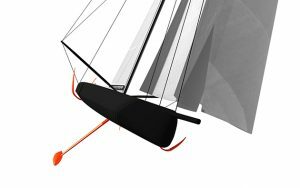 One issue with the IMOCA 60 plan is that it is likely to greatly reduce the number of crew racing at any one time – although sailors may be rotated in a squad. This could put one of the biggest legacies of this race, the gender crew rule that saw 23 women sailors racing in mixed crews, in jeopardy, although organisers have said it is a trend they hope to continue. Tough audience? IMOCA designer Guillaume Verdier talks to sailors and team managers in The Hague. Part of this plan is likely to involve extending the calendar of events beyond a single round the world race every three or four years. “It has been quite difficult, and also not sustainable, to build a boat that is not very well adapted to use for other events,” Salén told me by phone before the announcement. Salén says they are considering options that include a round Europe race to cover key sponsorship markets, as well as ocean courses, such as a transatlantic, but the current IMOCA calendar is governed by the next Vendée Globe, starting in November 2020. Nick Bice, who has been running The Boatyard shared maintenance department for the Volvo 65s, is leading the development of the new rule. We look at more of the questions surrounding the future of the race, including opportunities for female crew and possible future routes, in the August issue of Yachting World, out on Thursday 5thJuly. We also have a personal account from Dongfeng Race Team’s skipper Charles Caudrelier and shoreside navigator Marcel Van Triest of how the final leg and overall race was won. 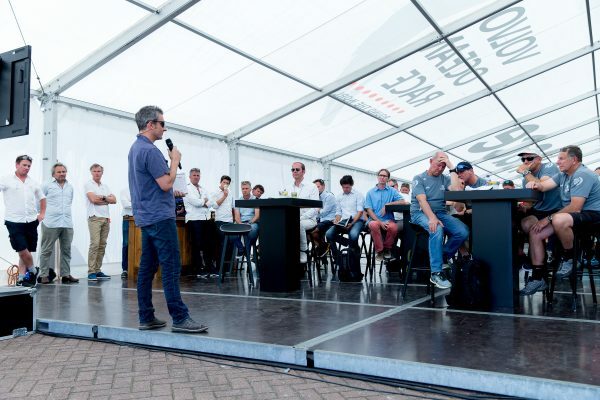 The post Volvo Ocean Race confirm next race will be held in IMOCA 60s – but opinions are divided among crews appeared first on Yachting World.